The summer is half way over and is flying by. Between vacation to Hawai’i and a milder summer, I have barely noticed. I’m hoping to get back caught up with all my posts soon. I had a MAT put that expired worthless so I got to keep the entire $242 premium. I then turned around after some weakness in MAT shares and sold 2 more January 2015 dated puts with premium totals of $510. I’m now keeping a smaller balance and securing a lot of these trades by holding stock in that same account. My total profit for the year is $1402.00. I earned $405.39 in dividends for the month. This is an increase of 79% from the same month last year. My total year-to-date dividend income is $5262.58. This is 52.6% toward my goal of $10,000 in dividends for the year. My expected forward 12-month dividend income has increased to $10,883.57 ($10, 681.01 + $202.56 from Motif) from $10,709.90, a 1.6% increase since last month. I am behind on my goal of 14,000 by year’s end. In order to reach my goal of $14k by the end of the year, I’d need to purchase $89,040 worth of stock at an average yield of 3.5%. This goal is looking like it won’t happen. I’ve now had 26 companies increase dividends so far this year. I completed the Yakezie challenge bringing my Alexa Ranking well under 200k and actually under 100k before I went on vacation. It has crept back up a little now. I haven’t had a chance to post about this but you can find my original post in January when I joined the challenge here. Things are now settled at my new office and I’m looking forward to a better second half of the year. My Condo rental has re-leased at the same rent , $1000/month for another year. All 3 properties are now leased for at least 9 more months now. I didn’t have a chance to post about this but I decided it was better to keep the current tenants than try for a $50 raise in rent. I posted my most recent electric bill that used up all my credit I had and then some. I’ve got a new bill that I’ll post about shortly. I’m now at $725k, up from $687k. This is a $38,000 increase in one month. The majority of this came from a much higher value from my primary residence on Zillow. The new value is close to what I’m now being taxed on so I believe it’s pretty accurate. Prices continue to climb fast here in this quickly growing city. I posted an article that was well received titled Dividend Yield vs Dividend Growth. I also included a handy spreadsheet for comparing companies with dividend yields and growth rates over time. I also made a quick post from Hawai’i with a shot of a beautiful sunset that I took. You can find that here. I’ll be posting a detailed account of my trip soon so look for that. My expected dividends for August are $1123 which would be a lot higher than July and quite a bit higher than August of last year. I am on track with my goal of 10k in dividend income. The forward goal of 14k may be next to impossible at this point. I’d rather add quality companies with a little lower dividend yield versus just adding higher yielders to meet it. I’m still using Motif Investing and plan another Dow 30 purchase as well as adding more to T soon. You can find a review I wrote by following that link. Fantastic month on many fronts. It really looks like you are ramping up your purchases. Hopefully the market will continue to retreat and give up some good buying opportunities. I just noticed Chevron has fallen about $10 a share in the last week or so. Aflac, Target, Ensco, and Kraft are a few others that are very interesting here. Thanks buddy. I’m hoping to ramp up contributions the second half of the year. I hope you’re right! If the market retreats, that means we get to buy more of the same great companies. Yeah, I noticed that. CVX is still a large position, 3.5% so I’m content with it for now. I like TGT and ESV here for sure. I need to look at KRFT again. You are just killing it yourself. Keep up the good work on your end also. You may be behind your dividend income goal, but I’d trade places with you any day. Keep up the great work. All of those purchases looked really, really solid. Thanks! Maybe we can trade places just for half the year. The summers in Texas are brutally hot. 🙂 I am jealous of all that free time you now have. If you can truly keep things going by just writing, I think you may already be at FI. You are not a slave to a company any more and are making money doing something you love part-time. Great Stuff!! you’re killing it. Thanks for the support. Keep up the good work on your end as well! Summer is indeed flying by and the inspiration from the dividend blogging community continues to excite me. All those purchases are super solid and it’s nice to see you chasing some high quality names instead of simply chasing shaky high yield. Happy to be a fellow shareholder with you in several of the names above. Look forward to your next update. Time flies when you stay busy. I also find lots of inspiration from our community of investors. There’s lots of great articles that help you stay focused. I’ve got a long ways to go but can see the light at the end of the tunnel. I think buying higher quality will pay off more in the long-run. 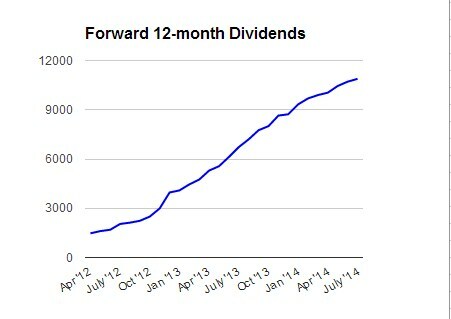 I’m ok with earning a little less now to earn more in the future with higher dividend growth rates. Another fantastic month for you, AAI. Congrats on the monthly income. Keep it up. Thanks alot! I’m behind in some of my goals but I’m still making some nice strides. Thanks for the support. Thanks! Yeah, the real estate market is definitely hot here. I was hoping to buy a few more rentals before prices inflated so much. As long as rates stay low I should still be able to pick up another next year. It is a paper gain but still nice seeing the net worth going up. At some point we’ll sell to realize the gains.